While moving between the courthouse and the van, there was a brief exchange of gunfire. The gunmen then loaded the hostages into the van and drove off. As the van headed to the 101 freeway, it was stopped by a police roadblock. After the van stopped, police and the gunmen exchanged gunfire. In the ensuing shootout, hostage-takers McClain, Christmas, and Jackson were killed. McGee was seriously injured. Judge Haley was killed by the shotgun the hostage-takers had secured to his neck. Deputy DA Thomas was paralyzed by a shot to his back, and juror Graham was wounded in her arm. Wow. Quite a botched operation all around. Definitely. The cops were too quick on the trigger (this was before police response to hostage situations had evolved to using more advanced techniques), and the bad guys were vicious and stupid; a dangerous combination all around. I just read about this a fefw weeks ago while doing some “look-up” stuff about (now professor???) 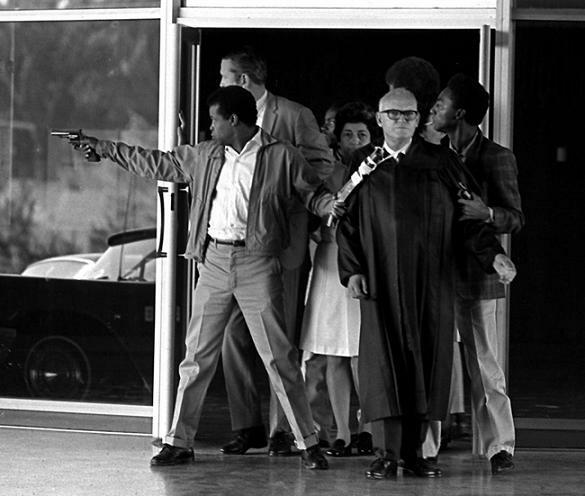 Angela Davis…SHE was held responsible for getting the WEAPONS (straw purchase) that were USED in this crime. And in 1980, she ran for Vice President of the US, if you can believe that. On the Communist Party ticket, of course. She’s currently teaching at Syracuse University, my grandmother’s alma mater. I somehow doubt my grandmother would approve.